If you’ve ever wanted to experience the thrill of sailing, here’s your opportunity. Lighthouse Marina has 2-person Hobie Bravo and 4-person Hobie Wave Catamarans for rent by the hour. Catamarans are fun, easy to learn and can accommodate all levels of experience and ages. Ever wanted to Stand-Up Paddleboard? Choose from our Hobie DuraSUP or YOLO Paddleboards. Paddleboarding is fun for all ages and fitness levels. You can lie down, sit, stand, and cruise around Lake Texoma with an incredible up-close view. Choose from our 1-person and 2-person kayaks to rent for some real fun! 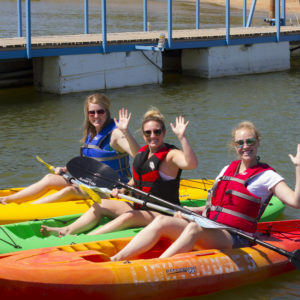 If you are looking for a fun family outing or want to explore Texoma up close, kayaks are fun and easy for all ages. We also have fishing kayaks for rent equipped with rod holders so you can catch the big one. Be your own skipper and take your family and friends on a pontoon boat. Pontoons are easy to drive and offer a great way to truly experience the lake. 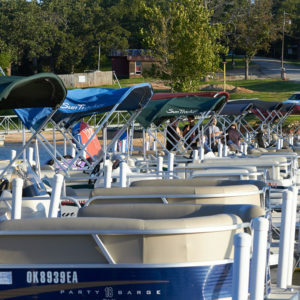 Lighthouse Marina offers 18′, 20′ and 24′ pontoon boats that accommodate up to 12 people.